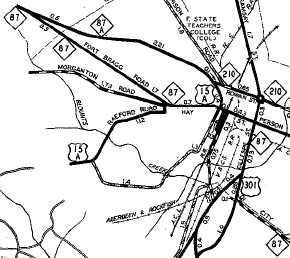 NC 87-A #1: Born between 1940-44 as new primary routing. Ran from US 15-A/NC 87 (Hay St) north on Robeson then around west on Bragg Blvd, where it ran back into NC 87 (Ft. Bragg Rd) about 3 miles later. 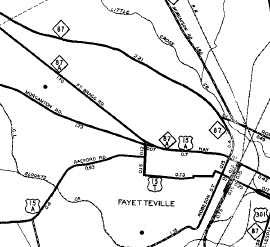 NC 87-A #2: Between 1945-49, NC 87 and NC 87-A swapped places. Now NC 87-A used Hay St/Morganton Rd/Ft. Bragg Rd out to Bragg Blvd. NC 87-A #2 is shown explicitly on the Fayetteville inset on the 1954 Black and White issue. It was decommissioned between 1955-57.